Some people base their favorite destinations strictly on the quality of restaurants that they find when they get there. For those that love good food and love to travel then finding some of the best food cities in America can be a real treat. You might be surprised, though, at just what cities really do have the best selection of restaurants and choices when it comes to culinary delights. From the creamy etoufees to the spicy creoles and hearty red beans and rice, New Orleans is a food conissouer’s dream! When coupled with some of the famous jazz music that can be found swirling around the small bistros in the French Quarter it’s hard to resist the zesty meals in this exciting city. 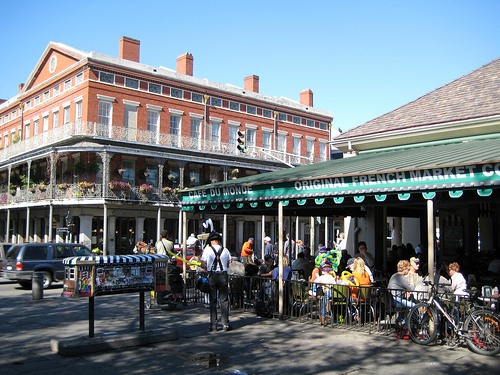 Try a coffee at the famous Café Du Monde before heading to Antoine’s, one of the most notable restaurants in the world. The next morning, don’t forget snacking on a delicious sugary beignet as you walk around the leafy, mysterious streets of the Garden District. With its great location on the Atlantic, Boston has some of the best fresh seafood in the United States. 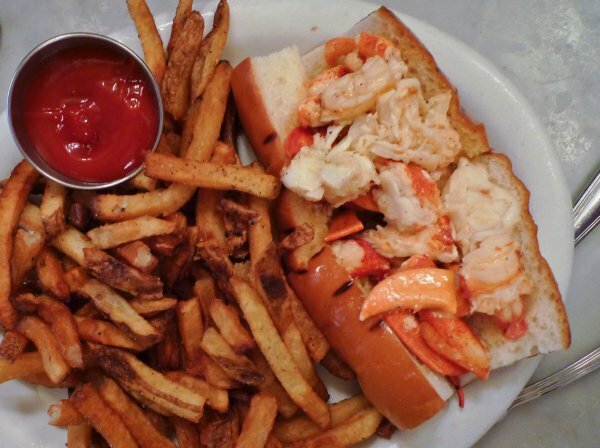 For the best lobster roll in town, visit Belle Isle’s Seafood. For the best chowder, however, Legal’s Seafood is still unmatched. Of course, seafood isn’t the only game in town. The North End has a wide selection of tantalizing Italian eateries, including the mouth-watering Terramia Ristorante where you can have homemade penne arrabiata and top if off with a cup of gelato. This southern city is known for its beautiful architecture, first-class hospitality, and delicious restaurants. Fried chicken, mashed potatoes, biscuits and gravy, and a wide variety of cakes and pies can all be found around the historical district. Pay a visit to Paula Deen’s place for homemade southern cuisine at its finest. For something a little different, however, the Olde Pink House is a great place for fresh seafood while Sunday brunch can be enjoyed at SOHO South Café. Las Vegas is rapidly becoming one of the best food cities in America. More and more famous chefs are opening up restaurants in Sin City and right now is the best time to visit for a fabulous meal. Whether you want a scrumptious pizza at Wolfgang Puck’s Spago, a delightful menu at Picasso’s, or an Italian meal to die for at Bartolotta Ristorante then you’ll find that your selections are varied and unique. Of course, there are always the plentiful buffets if you just want a little bit of everything! One of the best things about New York City when it comes to dining is all of the choices that you have. From upscale establishments to street vendors, it’s a cornucopia of food selections. The different ethnic neighborhoods also mean that nearly every food culture is represented someplace. For seafood, try Oceana, for French give Jean Georges a try. Of course, nothing says “New York” like dinner and dancing at the Rainbow Room. If you want a little of everything and can’t make up your mind then Eataly is a food hall that won’t have anyone leaving hungry. Don’t forget to try one of the Jewish delis, too. 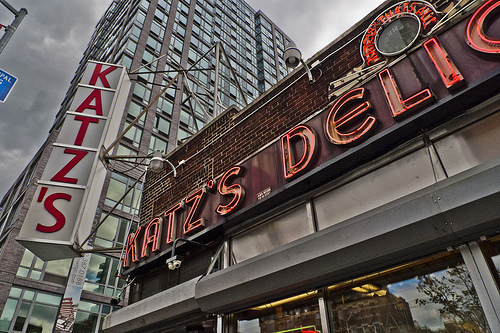 New York is known for having some of the best pastrami sandwiches in the world. While you might be tempted to try some of the terrific fresh seafood that permeates the restaurants in San Francisco, don’t overlook some of the city’s other scrumptious delights. It is the home to Ghirardelli chocolates, after all! Chez Panisse might be one of the city’s most famous restaurants, but there are other notable places such as the Ferry Plaza Farmer’s Market where fresh food can be bought and consumed right on the spot, The Slanted Door that boasts mouth-watering caramelized shrimp, and the unique blend of Californian and Italian food at Oliveto. A walk through Chinatown will assault you with a variety of hole in the wall eateries and bakeries that are as authentic and tasty as anything that you’ll find in Shanghai, too. Nobody does barbeque like Memphis! Combine a home cooked meal of zesty barbecue ribs, mashed potatoes, and soulful blues while you check out Beale Street. Visit Gus’ World Famous Fried Chicken for southern and soul and the Germantown Commissary for some of the best barbecue in town. For something a little different, the Texas de Brazil on Peabody might not be cheap, but you’ll end up with enough food at this Brazilian steakhouse to last you for days. What’s a visit to Chicago without a slice of their famous pizza? 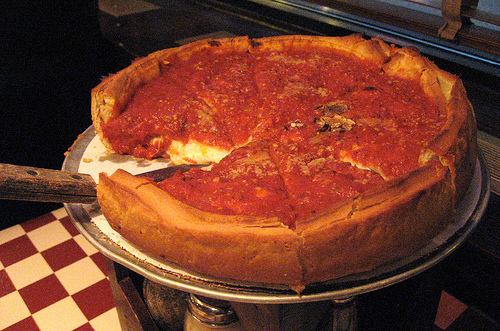 You can still find authentic Chicago style pizza at one of the original places such as Geno’s or Uno’s. Just remember: They come big! There is also a wide variety of Polish, Greek, Italian, and even Mexican food on hand, too. For something a little more laid back, a trip to one of the casual pubs like the Girl & the Goat can be a great way to have a meal and check out the local scene. A charming atmosphere and beautiful architecture blends in with delicious culinary delights in Montreal, making it one of the best food cities in North America. You could spend a lot of time discovering the small, intimate French bistros that line the streets, but you’ll also enjoy taking in some of the favorite local delights such as poutine which is essentially French fries smothered in gravy and melted cheese. Kazu is the place to go for great Japanese, but Au Pied de Cochon is one of the best places in town (and priciest) for French cuisine. 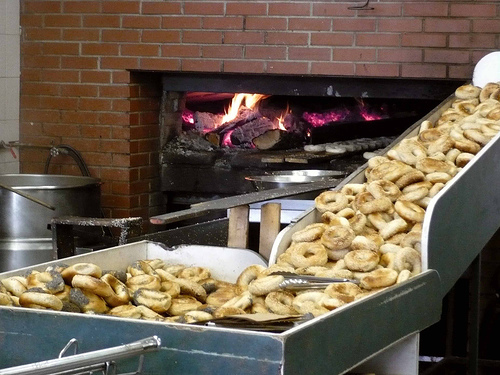 Of course, you don’t want to pass up any of the amazing bagels that you’re bound to come across while you’re there. They are some of the best in the world! Houston is really starting to take off on the culinary scene and for good reason, too. With it being so close to the country, you’d almost expect to find good Mexican food, such as what you can find at Hugo’s, but you can also come across New Texas cuisine, barbecue, Italian, and even a great selection of seafood restaurants as well. Café Mawal is one that has everyone talking right now with its casual homemade food and almost picnic style atmosphere.